Haul-Off Belts by german companies. Our belts are equipped with thermofixed edges for short and medium lengths. Longer belts - from approx. 6'500 mm - we recommend to fit solid rubber edges. Thus we ensure optimum protection of the reinforcement layer. For operation in rotating machines solid rubber edges are provided standardly. 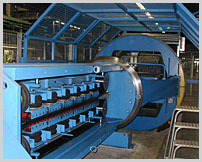 Antriebs- und Foerdertechnik's belts are characterized by particularly smooth and straight run. See for yourself the quality of our belts!